A few months ago I listened for the first(!) time to Dixit Dominus, composed by Georg Friedrich Händel (1685-1759) in 1707. It is an absolute masterpiece of Baroque music. When you search YouTube for Dixit Dominus Handel, you will find more than ten different recordings. I found it interesting to compare them. Listen for example to the first bars of the slow recording by Sir David Willcocks 1965) and the very fast one by Andres Mustonen (2018)! Händel wrote Dixit Dominus when he was 22 year old and staying in Italy, in Florence and Rome. In Germany he had already made a name for himself with the opera Almira, composed when he was 19 year old. But during his stay in Rome, operas had been (temporarily) banned by pope Clement XI because he considered them immoral. So Händel composed mainly sacred music while in Rome. 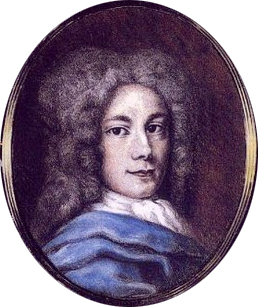 The portrait is dated about 1710. Dixit Dominus is a musical setting of psalm 109 from the Book of Psalms, which is part of the Christian Old Testament. The title comes from the first line of the Latin text of the psalm: Dixit Dominus Domino Meo, which translates (in the King James version) as The Lord said unto my Lord . A rather cryptic line, is the Lord talking to himself? The explanation is that in the Hebrew text two different words are used for Lord. The Lord who speaks is God and he speaks to the psalmist’s lord. This lord is seen as the Messiah and in the New Testament Jesus quotes this psalm that he is the Messiah and the son of God. That is the reason that this psalm 109 plays an important role in the Christian liturgy, the psalm is sung often in the Roman-Catholic Vespers. Actually, Händel was not the only composer who wrote a Dixit Dominus. Vivaldi even wrote three versions, RV 594, RV 595 and RV 807 (my personal favorite). On YouTube you can also find versions written by Pergolesi and by Alessandro Scarlatti (the father of Domenico). The last line of the psalm in the Händel version is sung as a duet by two sopranos and choir. It is impressively beautiful and in the Gardiner recording it was given as an encore. Here it is, put the volume high and listen to what you can read in one of the comments: One of the most beautiful pieces of music ever written. De torrente in via bibet, propterea exaltabit caput. The webpage about the last line has the title “Prophesying Christ’s humility and the Ascension” . The humility is that he just was drinking water from a brook, the ascension is indicated by the lifting of the head .